Ribbon cable assemblies, also known as flat ribbon cable assemblies or planar cable assemblies, are assemblies utilizing multiple wires and typically IDC (insulation displacement connector) terminations. The cables used in this type of assembly are prepared by laying conducting wires flat and parallel to each other, resulting in a product that is wide and flat, resembling a ribbon. Because ribbon cables are flat and flexible, they can be easily routed in confined spaces or used in applications where there is limited space. Ribbon cables can be run effortlessly within straight run applications however, due to the cable’s ribbon profile, they do not allow for sideways flexing. If a change of direction is needed in a ribbon cable installation, right angle changes can be accomplished by folding the cable over on itself. Ribbon cables are commonly specified by two values – the spacing and the number of conductors in the assembly. The spacing, or pitch, is available in a variety of distances and typically is available in 0.025”, 0.050”, 0.100”, 0.156’, and 1mm pitch, with custom spacing available if needed. The number of conductors, or ways, of an assembly corresponds to the number of positions that a connector can accommodate. The connectors have been standardized to a set number of ways and because of these assemblies are usually restricted to 4, 6, 8, 9, 10, 14, 15, 16, 18, 20, 24, 25, 26, 34, 37, 40, 50, 60, 64, and 80 positions. The most common wire used in ribbon cable assemblies is stranded copper wire ranging in size from 18 AWG to 34 AWG or finer. The insulating materials used for ribbon cables is most common PVC but Teflon and olefin based materials can also be an option. For termination simplicity, ribbon cables typically are either edge marked or color coded. The edge marking or color coding allows the alignment of certain pins on the connector and reduces the risk of reversed connections. Generally, ribbon cables will have one edge marked in a contrasting color to the remainder of the cable, with the color of the edge mark in some instances corresponding to the pitch or center spacing of the cable, for instance a 0.050” spacing cable typically uses a red edge mark. This mark is used to signify the conductor that is terminated to pin 1 on the connector. For color coded cables (rainbow ribbon cables, twist-n-flat cables) the individual conductors are produced with a repeating pattern of colors. This pattern usually follows the standard resistor color code of brown, red, orange, yellow, green, blue, violet, gray, white, and black. If more than ten conductors are needed the color pattern is repeated. The greatest advantage to using ribbon cable is the ease of termination. With fixed and controlled spacing, ribbon cables can be mass terminated with the use of an IDC connector. IDC connector uses a sharp forked contact that pierces the insulation and makes contact with the conductor. This process is typically performed on both ends of an assembly, though there are instances where only one end of an assembly will use IDC and the other end terminated using a crimp or solder. IDC connectors are identified by the pin spacing, the number of pins, and the number of rows. Ribbon cable assemblies are often used for internal components in a computer; specifically hard drives, CD drives, and floppy drives. Other uses include connecting moving components such as print heads, consumer electronics products and white goods, test and measurement equipment, automated termination equipment, robotics, and medical equipment. When designing an assembly where space is a major constraint, use of a ribbon cable can prove an advantageous choice. 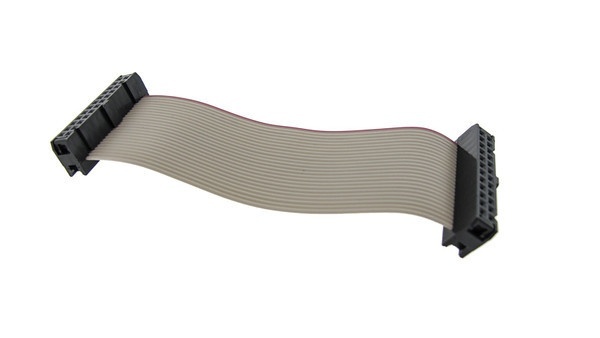 Ribbon cable assemblies are available in several different pitches and conductor counts that match the standard IDC connectors. In addition, materials are available to meet the requirements of high temperature applications as well as applications that will be used in hostile environments. Ribbon cables offer the ability for mass termination and are a cost competitive choice for some installations. To learn more about cable assemblies, download our free Ebook below. If you're ready to order ribbon cables, Epec is ready to help! Request a quote today.